Several days ago we released a new tool for websites which are revenue-focused and are trying to maximize their income. It's SWIFT - Slow Websites Investigation for Financial Target, www.webogroup.com/corporate/test-speed/. 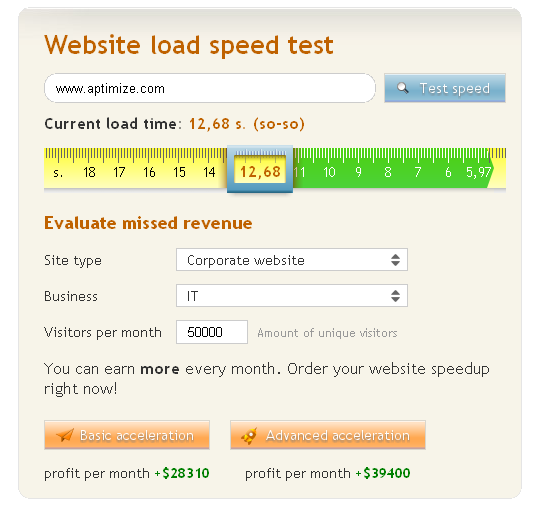 Now you can just enter your website address, get its load speed, get projected acceleration, and calculate how much do you loose every month with your current website speed. We included a number of pre-defined patterns for e-commerce activity: e-stores, blogs, corporate websites, news, and portals. Also there is an industry selector to specify your model more accurately. You earn money with every visitor to your website, also you miss some opportunities with a slow website. Now you can just calculate how much do you miss every month. Try it now: SWIFT - an easy tool to calculate missed revenue.